Property Details: 1 Bedroom, 1 Bathroom Beachfront Residence with approx. 615 square feet. 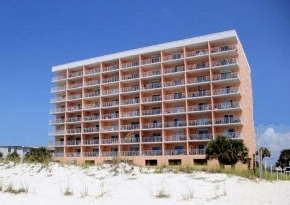 Gulf Shores beachfront condo for sale at Seacrest. This 2nd level beach resort home is easily accessible via walking up a flight of stairs or by using the elevators. The condo is conveniently situated near stairs and trash chute. Open living-room, dining-room and kitchen includes an eating bar. Sleeper sofa in the LR and tile floors throughout, except for the carpeted bedroom. Pocket-door separates sleeping quarters. Hall has bunk bed alcove, bedroom and bath. Stack clothes washer & dryer. Private patio includes storm shutters. Exceptional views of the Gulf of Mexico and the popular white-sand beaches on Alabama's gulf coast. The community is conveniently located near restaurants, shopping and entertainment - come see this one today! Orange Beach and Gulf Shores Alabama are popular family beach vacation destinations, offering an array of outdoor activities including dolphin siting cruises, championship golf courses, deep-sea fishing, snorkeling, kayaking, nature hikes and more. Choose from national hotel and motel chains, camping or a variety of beach houses for your stay. There are numerous options for nightlife, from family entertainment to rocking roadhouses, enjoy your pick of plays, free concerts, dancing or just listening to a variety of musical genre. The subtropical weather in Gulf Shores and Orange Beach allows for year-round activities in these popular Gulf Coast communities.